Ahead of the final four games of the season against Dartmouth, Harvard trailed the Big Green by one game in the Ivy League North Division standings. This exact situation was nothing new for the Crimson. 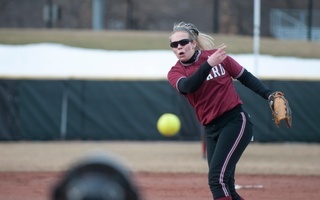 In 2016, Harvard softball took three of four games in a home-and-home series with Dartmouth, clinching the North Division and earning a berth in the Ivy League Championship Series. In 2017, however, the Crimson needed only three games to get the job done. With an 8-4 victory in the first game of Sunday’s doubleheader, Harvard booked its trip to Princeton, N.J. to take on the Tigers in the best-of-three playoff series. All told, the Crimson (22-17, 13-7 Ivy) closed out its season at home with a four-game sweep of the Big Green (11-28-1, 10-10), outscoring the Big Green by a combined tally of 32-12. Home runs were key for Harvard’s offense this weekend. The team hit nine of its 19 total homers in these four games alone. Seven runs in the bottom of the second and masterful pitching from the freshmen duo of Olivia Giaquinto and Alissa Hiener was all the Crimson needed to shut out Dartmouth in its final regular season game. 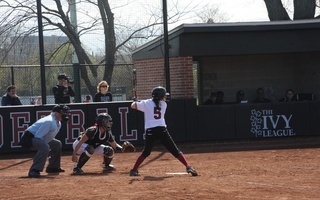 Following the seven-run outburst early on, the game was won on a walk-off home run in the bottom of the fifth, as a solo blast off the bat of freshman second baseman Isabelle Haugh gave Harvard an eight-run advantage. The team streamed out of the dugout to meet Haugh at home plate after the first home run of her career. Having already clinched a spot in the Ivy League Championship Series, Allard opted for her two freshmen arms to handle the pitching duties in the final game. Giaquinto made her fourth start of the season in the circle and fired four shutout innings, allowing only three hits and one walk. Returning from injury, Hiener made her collegiate debut in relief in the top of the fifth. The freshman stranded runners on first and second to preserve the shutout. Dartmouth capped off its eighth consecutive Red Rolfe Division championship-winning season with a four-game sweep of Harvard this weekend, picking up two wins in Hanover on Saturday and two more in Cambridge on Sunday. ​Harvard softball traveled south for the second consecutive weekend, and the Crimson (4-4) dropped its first three games at the Eagle Classic in Statesboro, Ga. before earning a victory against Eastern Kentucky. Returning to Cambridge after an away win at Bryant, Harvard (15-15, 6-6 Ivy) looked to reverse its fortunes as it kicked off its divisional slate with two doubleheaders against Yale (11-24, 5-7). The Crimson managed to do just that, taking three of four from its rival from New Haven.